← Giant Bears, historic and ancient Over 12 feet tall – Monsters of the Past. Ancient Giant Birds, 12 to 25 feet wingspan. Argentavis, the 25 foot terror bird. 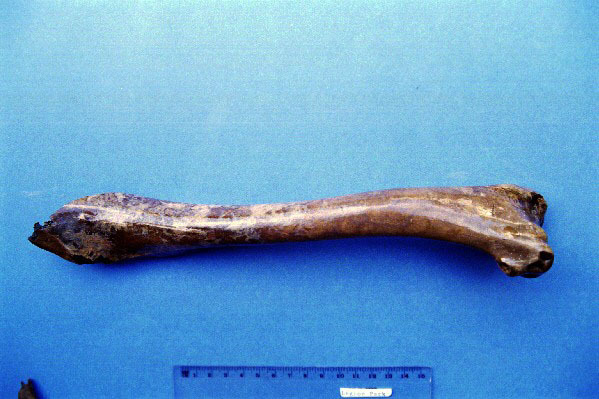 The humerus of the giant 14 foot Teratorn, found near Woodburn, Oregon in a 10,000 year old deposit. Teratornis merriami (Miller, 1909). This is by far the best-known species. Over a hundred specimens have been found, mostly from La Brea Tar Pits. It stood about 75 cm (29.5 in) tall with estimated wingspan of perhaps 3.5 to 3.8 metres (11.5 to 12.5 ft), and weighed about 15 kg (33 lb); making it about a third bigger than extant condors. It became extinct at the end of Pleistocene, some 10 000 years ago. Teratornis woodburnensis (Campbell & Stenger, 2002). The first species to be found north of the La Brea Tar Pits, this partial specimen was discovered at Legion Park, Woodburn, Oregon. It is known from a humerus, parts of the cranium, beak, sternum, and vertebrae which indicate an estimated wingspan of over 4 meters (14 ft). The find dates to the late Pleistocene, between 11,000 and 12,000 years ago in a strata which is filled with the bones of Mastodon, Sloth, Condors, and evidence of human habitation. Aiolornis incredibilis (Howard, 1952), previously known as Teratornis incredibilis. This species is fairly poorly known; finds from Nevada and California include several wing bones and part of the beak. They show remarkable similarity with merriami but are uniformly about 40% larger: this would translate to a mass of up to 23 kg (50 lb) and a wingspan of about 5.5 metres (18.04 ft) for incredibilis. The finds are dated from the Pliocene to the late Pleistocene, which is considerable chronological spread, and thus it is uncertain whether they actually represent the same species. Cathartornis gracilis (Miller, 1910). This species is known only from a couple of leg bones found from La Brea Ranch. Compared to T. merriami, remains are slightly shorter and clearly more slender, indicating more gracile build. 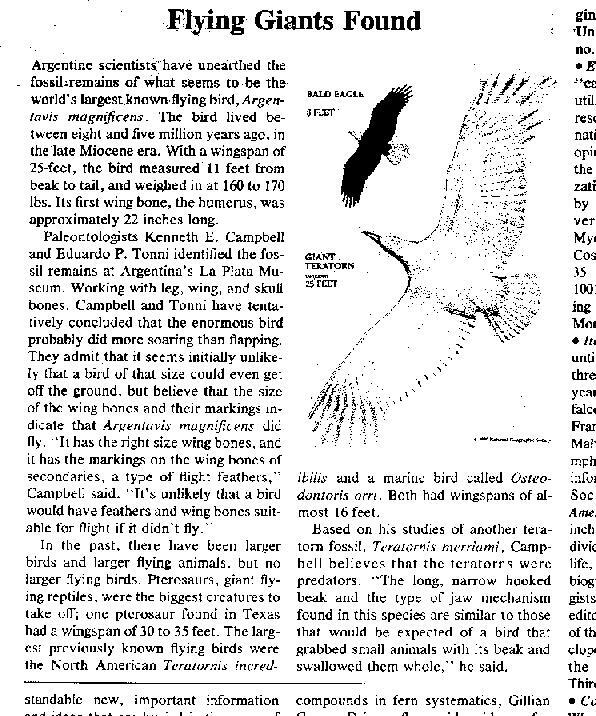 Argentavis magnificens (Campbell & Tonni, 1980). A partial skeleton of this enormous teratorn was found from La Pampa, Argentina. 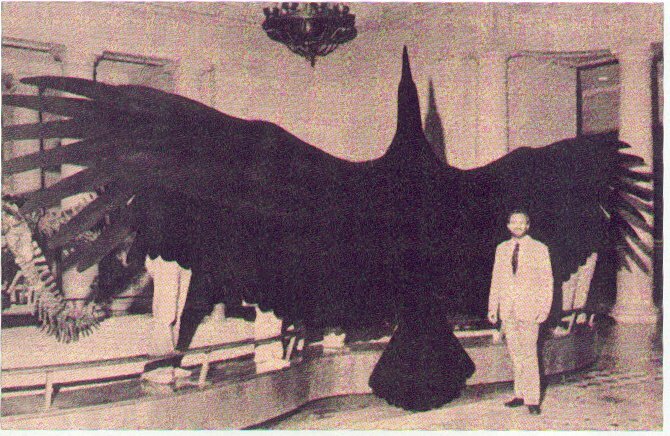 It is the largest flying bird known to have existed. It is the oldest known teratorn, dating to late Miocene, about 6 to 8 million years ago, and one of the very few teratorn finds in South America. Initial discovery included portions of the skull, incomplete humerus and several other wing bones. Even conservative estimates put its wingspan at 6 meters and up (some 20 ft), and it may have been as much as 8 metres (26 ft). The weight of the bird was estimated to have been around 80 kg (176 lb). The estimated weight and wing area rival those of the largest pterosaurs. Another form, “Teratornis” olsoni, was described from the Pleistocene of Cuba, but its affinities are not completely resolved; it might not be a teratorn at all. There are also undescribed fossils from southwestern Ecuador, but apart from these forms, teratorns were restricted to North America (Campbell & Tonni, 1983). Some cryptozoologists such as Ken Gerhard, and Mark A. Hall have expressed interest in Teratorns as a possible explanation of anecdotal sightings of very large birds in Texas and Illinois and popularly known as Thunderbirds. Giant Condors from California to Peru with 10 to 12, even 14 to 16 feet wingspans were reported in old news paper reports from the 1930’s to mid 1800’s, stories of condors attacking men, boys, and cattle, and able to lift a fawn or small deer and carry it in its talons were even reported. Some of these are likely quite fanciful tales, but I think they did get as big as the fossil condors indicate, the Teratorns Merriami, Woodburnensis and Incredibilis had 12 t0 18 feet wingspans in N. America and in the Pleistocene mega fauna era… Not millions of years ago, but just a few thousand years ago. Condors once flew all over America just 150 years ago, From Alaska to Patagonia. Lewis and Clark recorded 9 and 10 foot condors they shot on the clumbia river up in Oregon and Washington territory in 1806 –Today there are no Condors in Oregon, and just a handful in California –like the Grizzly bear, and the Buffalo, Condors are basically extinct. Giant 14 – 16 ft winged fossil Teratorns have been found in Oregon, at Woodburn in 10,000 year old stratum contemporary with human occupation. The average condor today in California is about 9 to 10 feet wingspan in males, and those in South American Andean Condors 10 to 11 feet wings spread, but there are records of both species exceeding 11 and 12 feet, which would make them the size of the Teratorns Merriami from La Brea Tar pits. That there were larger examples of modern condors with 13, 14, 15 and 16 feet wings spread is not beyond the limit of physics, and is supported by eye witness testimony and old historical documents, and I believe these birds, perhaps relict forms of Teratorn Condor, are responsible for the ancient and recent Thunderbird legends and sightings. Condors in Peru, 1844 with 15 ft wingspans. 14 ft condor attacks hot air balloon. 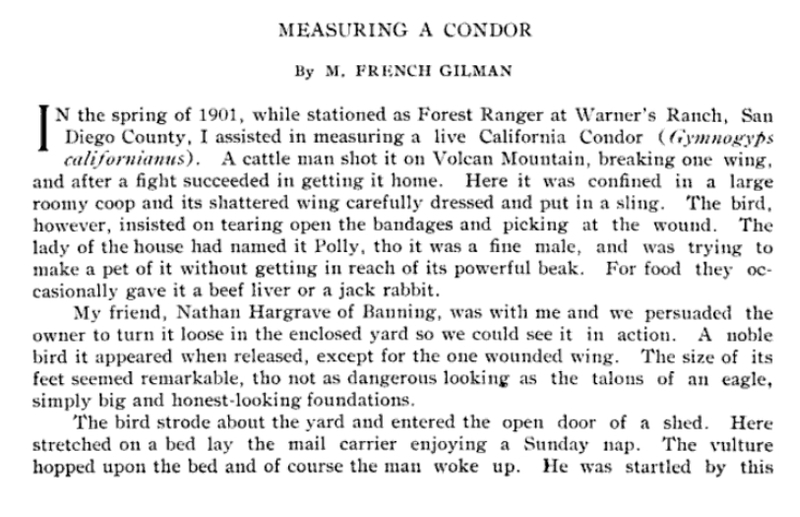 11 ft 7 wingspan condor attacks Southern Californian man 1906.
condors shot with 15 feet wingspans, and tales of 18 ft winged birds weighing 40 lbs. 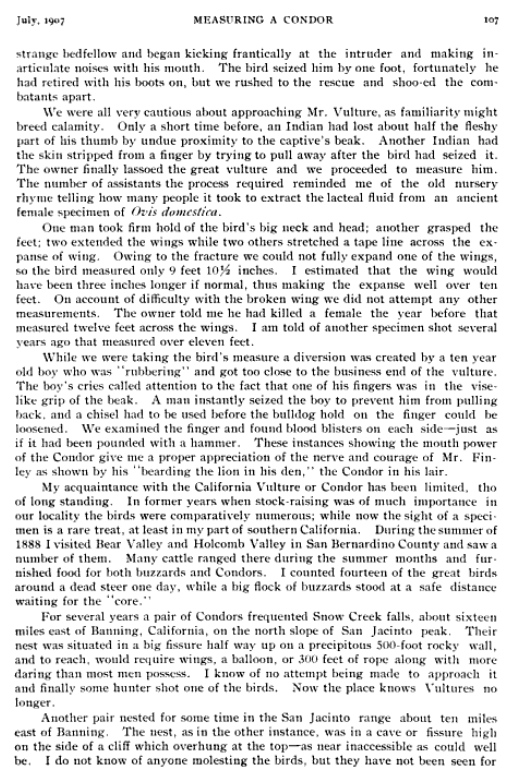 The condor, volume 9, 1907 pg 106. The Condor, Volume 9, 1907 pg 107. Pelagornis sandersi is a species of extinct flying bird with a wingspan estimated to be between 6.1 and 7.4 m (20 and 24 ft). If the larger estimated wingspan holds true, this makes it the largest flying bird yet discovered, and twice as large as the largest living flying bird, the wandering albatross. In this regard, it supplants the former largest known flying bird, Argentavis magnificens (which is also extinct). Its wingspan, without feathers, was about 4.0 m (13.1 ft), while that of P. sandersi was about 1.2 m (3.9 ft) longer. Its fossil remains date from 25 million years ago, during the Chattian epoch of the Oligocene. It had short, stumpy legs, and was probably only able to fly by hopping off cliff edges. It has been estimated that it was able to fly at up to 60 km/h (37 mph). Some scientists expressed surprise at the idea that this species could fly at all, given that, at between 22 and 40 kg (48 and 88 lb), it would be considered too heavy by the predominant theory of the mechanism by which birds fly. Dan Ksepka of the National Evolutionary Synthesis Center in Durham, North Carolina, who discovered the new species, thinks it was able to fly in part because of its relatively small body and long wings. While P. sandersi’s wingspan of somewhere between 6.1–7.4 m (20–24 ft) is believed to be the largest known among birds, it is still far from the largest known flying animal. Flying pterosaurs such as Hatzegopteryx and Quetzalcoatlus are believed to have reached wingspans of up to 10–11 m (33–36 ft).